Gary Dunn was a three year letterman, 1973-1975, for the University of Miami. Dunn ranks amoung the more brilliant defensive tackles that Miami has had through the years. 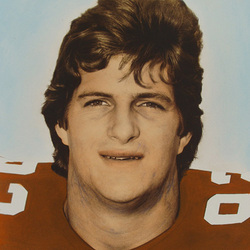 Dunn was an extremely strong and agile player and was drafted by the Pittsburg Steelers in the 1976 draft and went on to play, and win, two Super Bowls. He is also a third generation Hurricane, his grandfather, Dr. Bowman Foster Ashe, was the founding president of the University of Miami, and his father, Eddie Dunn, is still considered one of the University of Miami's all-time great running backs and he is also a member of the UMSHoF. With Gary's induction, Eddie and Gary Dunn became the first father-son duo to be enshrined into the UM Sports Hall of Fame.